Have you seen Appalachian Loosestrife? In a joint effort to expand the knowledge and understanding of the flora and fauna of Polk County, Conserving Carolina and botanist David Campbell need your help in locating this month’s “Polk County’s Most Wanted—Plant,” Appalachian Loosestrife (Lysimachia tonsa). Appalachian Loosestrife is a rhizomatous perennial herb with stems that range from 30-80 cm in length. Stems are typically covered in numerous, erect glandular hairs. Leaves are simple, lanceolate or ovate, and alternate with a short petiole. Flowers are yellow, with five sepals that are often reddish at their base. In our region, flowering occurs from late June to late July. Found in mesic forests with sunny openings throughout scattered areas of the southeastern United States, this is a rare species in North Carolina, known from only a handful of sites. 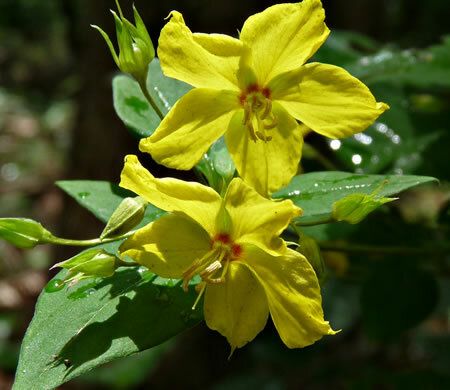 In Polk County, seek out Appalachian Loosestrife by looking along forested slopes with sunny areas, woodland trails with open aspects, and old logging roads. The next 3-4 weeks will be an opportune time to search for this attractive species. Oils from this and other species in the genus Lysimachia are used by native bees of the genus Macropis. If you think that you have seen Appalachian Loosestrife in Polk County, please send photos, questions, or comments to Pam Torlina at Conserving Carolina by phone at (828)697-5777, ext. 300 or email, pam@conservingcarolina.org.